The name originally originated from leaf called "Siru" found in hilly regions of Nepal. The shape and size of the knife has been influenced by the fascination of farmers towards this leaf. The name originally originated from leaf called "Siru" found in hilly regions of Nepal. The shape and size of the knife has been influenced by the fascination of famers towards this leaf. The leaf itself is very sharp and can cut one finger if mishandled. It is much slimmer and lighter compared to other kukris/khukris and yet very effective. It is designed for daily household purposes. 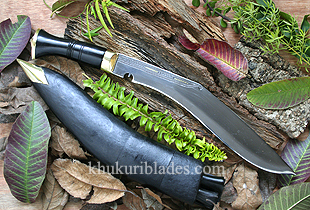 The effortlessness easiness and effectiveness of Sirupate makes this kukri/khukri very special. It is also accompanies a male dancer to perform the traditional "Khukuri dance". It is very renowned among Nepalese. It comes in variety of sizes from 8" mini to 18" sacrificial sizes. Wood handle also available. Mention this when ordering.